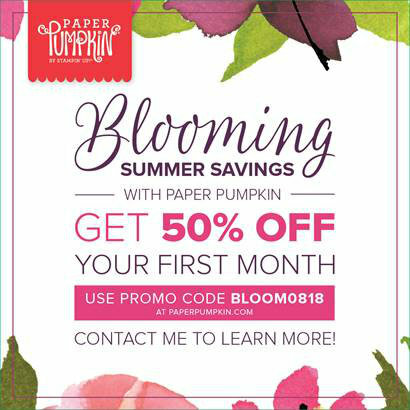 Before I share today’s card, I want to remind you about July’s incredible specials which end tomorrow: our FREE Ink Pads promotion and our Buy Three Get One Free Pattern Paper special. The FREE Ink Pads promo is an amazing offer for brand new Demonstrators. Sign up to join my Team in July and you will get your choice of ten free ink pads in addition to your Starter Kit. For the ink pads, you can select either the two In-Color Assortments or one of the four Color Families – Brights, Regals, Subtles, or Neutrals. Who doesn’t love FREE products? That is $67.50 in free ink pads in addition to the $125 of products you’ll select for your kit. That’s $192.50 in products all for just $99. Whoa! Talk about a deal! The second special for July is our annual Paper Sale. It’s an incredible offer of buy 3, get 1 free on select packs of Designer Series Paper, this is a great time to stock up. And now for today’s card… A quick card using the Varied Vases stamp set. I love how you can get a nice, quick and simple card with this set. It doesn’t require a ton of stamping or hand cutting a bunch of images. I used the background stamp from the Love What You Do stamp set to get the watercolor wash background. You might have noticed that my vase is 3D. This is a really simple trick. I use my stylus from the Simply Scored tool along the back side edges of my vase. This causes the paper to curl slightly. Then I adhere it to the card stock using dimensionals so it doesn’t flatten out when it’s glued down. You can see here in the close-up that my vase looks like glazed porcelain. I used a bit of my fine-tip glue across the entire vase to give it that shiny look. I stamped my flowers in two different colors. First in Flirty Flamingo and then again in Berry Burst. You can see just a hint of the Flamingo peeking through the Berry. This Varied Vases stamp set and coordinating punch are great when you need a quick and simple card. The combinations of flowers and vases are endless. I definitely recommend this pair as a must-have. If the FREE Ink Pad or Paper Sale promos didn’t grab you, then this last one is definitely for you. This is a Paper Pumpkin special for new subscribers only. Subscribe between July 11–August 10 and you’ll get 50% off your first kit. This is for new* month-to-month subscribers only and cannot be applied to prepaid codes. The 50% discount only applies to the new subscriber’s first kit shipped. After that, the price for each month’s kit will return to the regular price of $19.95.